As sparkling wines continue to grow in sales in the U.S., wine drinkers are looking for alternatives to Champagne, but what about higher end imports from Spain? More specifically, is high quality Cava an oxymoron? Although oceans of Spain’s sparkling Cava wash up on U.S. shores each year, high end Cavas do actually exist and are beginning to appear on restaurant lists – at prices that rival Champagne. 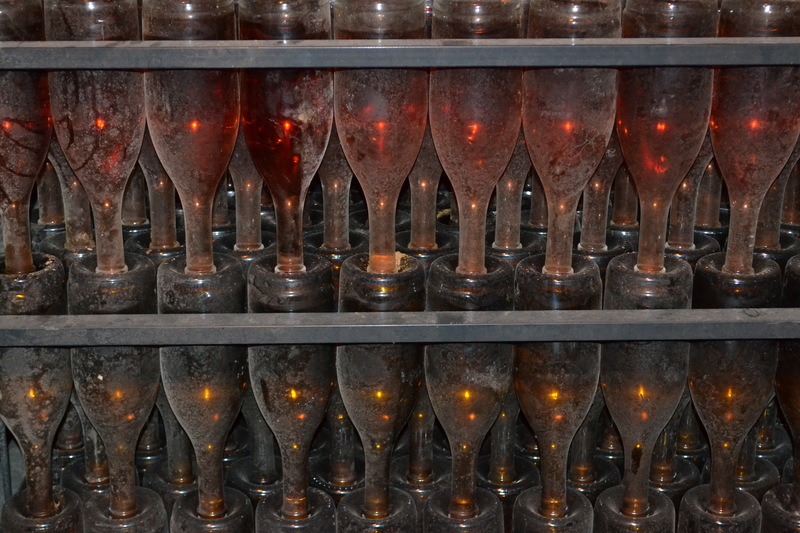 Like Champagne, Cava is produced using the Traditional Method for sparkling wine. Cava, however, is most often a blend of varieties based on the indigenous xarel-lo, macabeo and parellada. In Catalonia, as in sparkling wine regions elsewhere, some producers are playing with Champagne’s Chardonnay and Pinot Noir (permitted in 2002 and 2008 respectively) in their pursuit of producing high quality Cavas. Cava is big business. There is a lot of Cava produced (250 million bottles a year) and much of it is produced by multinational companies dealing in multi-million bottle productions. Compounding the problem of large volume production, while Cava is indeed a specified denomination of origin (DO), it is unusual in that the actual territory is scattered across Spain lacking the distinct and compact borders associated with other denominations. In this regard, Cava can legally be produced in 160 municipalities, most of which are in Catalonia, but 3% of production comes from other regions. Consequently, the Cava DO serves more to define production methods than to mark geographical terroir. Despite a fairly broad geographical designation, Cava’s true origin and heartland is still centered on the village of Sant Sadurni d’Anoia in Penedès, where the climatic and soil conditions produce the best wines. The majority of the best producers are found within this area. Moreover, some producers are quietly raising the bar with self-imposed quality standards that significantly exceed the rules set by the DO. And they are slowly raising the profile of Cava, albeit too slowly for some (more on that later). Most visibly, these higher end producers concentrate on substantially increasing the time spent on the lees, focusing exclusively on the longer-aged categories or both. One example of a high-end producer is Juve Y Camps. Their flagship Reserva de la Familia, brings together Spanish grapes xarel-lo, macabeo, parellada with chardonnay. 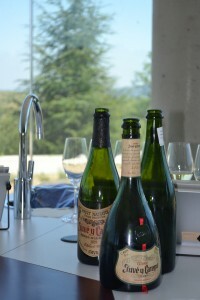 The winery also produces a 100% chardonnay Cava as well as one from 100% pinot noir. Under the minimum requirements, Cava must be aged for at least nine months in contact with the lees, but better producers far exceed these minimums. At Juve Y Camps, all of the Cavas spend a minimum 30 months on the lees and the emphasis on quality also extends to their choice to sell off the first press and take only the second press juice. 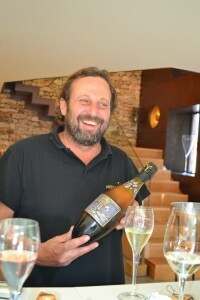 This is the opposite of the way grapes are pressed in Champagne, but, as explained by winemaker Antoni Cantos Llopart, the traditional Cava grapes are larger sized and more easily juiced than those used in Champagne. Interestingly, one of the largest commercial Cava producers, Freixenet, is now producing a boutique product. Reclaiming the Ferrer family’s original 1852 estate at Casa Sala, the family has restored the old winery complete with its 150 year old press from Champagne, which is still in use. Limiting production to only one wine at this historic property, the Casa Sala Gran Reserva Cava is a finca (estate) wine, aged for seven years and only made in great vintages. (In contrast, general cava regulations only require 30 months of lees aging for Gran Reserva and 15 months for the Reserva category). Another high end producer finding its way onto several NYC wine lists is Recaredo and it seems the adulation of these New York wine directors is warranted. Established in 1924, Can Recaredo focuses exclusively on indigenous grapes and actually pulled out its pinot noir vines several years ago as part of its commitment to quality. Further, the winery switched to biodynamic viticulture, becoming certified in 2010. Recaredo produces a single vineyard Cava from the property’s oldest vineyard, planted in 1940. The company’s production is limited to Gran Reserva level, vintage-dated Cavas, with all wines exceeding the minimum aging requirements. They are also all brut nature (no dosage) as a way to represent the landscape and ensure that the wines are especially well suited for food pairing. This emphasis on long aging is not a new idea. Although the Agustí Torelló Mata winery wasn’t founded until 1993, the family began producing its Kripta wine (with seven years of lees aging) as early as 1979, mainly for friends and family. Today, their entire 500,000 bottle annual production is all estate produced and aged longer than required by law. Moreover, not only are the grapes hand harvested, but the vineyards are only at 50-60% of the permitted maximum yield. In addition, they use very low (and slow) pressure for pressing –the equivalent to that used for blowing up a balloon– to minimize damage to the grapes. Similarly, the entire tirage process is completed at once in January since it is the coldest month and therefore the development will be slow, promoting tiny bubbles and elegance. In response to Cava’s declining image, the Cava Consejo Regulador (Regulating Council) has proposed a new classification, Cava del Paraje Calificado, (paraje meaning “place”) in the hope of creating a premium category for Cava as a brand. This new designation would be reserved for wines produced from single, estate-owned vineyards. While the classification has not yet been officially approved, nor have all of the precise regulations been agreed upon, aging requirements are expected to be at least at, if not above, existing minimums. Additionally, bulk practices, such as that of buying base wines, will, not surprisingly, be banned. For some wineries, though, these changes have come much too late. 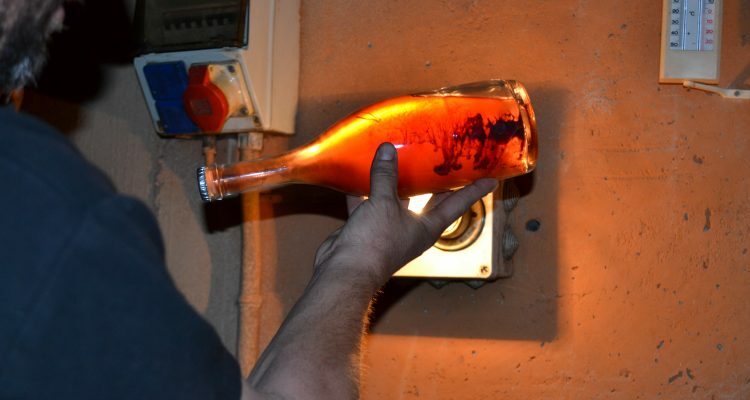 Several producers have already begun to pursue an alternate course in producing sparkling wines in the region. Guided by Penedès DO President, Jose Marie Albet of Albet I Noya, some former members of the Cava DO are now producing their sparkling wines as Penedès DO Traditional Method wines. Jose Marie and his colleagues want to protect quality of the wines as well as the growers of the region. Thus, regulations for Penedès DO Traditional Method wines are stricter, requiring a minimum of 15 months of aging instead of nine months. In addition, their goal is to eventually have all of the grapes for Penedès DO Traditional Method wines be 100% organically produced; today they are at 50%. Another path toward a solution to this “Cava problem” has been that taken by Pepe Raventos, a descendant of the very first Cava producer. Raventos has led a mutiny of sorts in seeking to establish a brand new DO in the area. He and several other producers have banded together in the hope of creating the Conca Del Riu Anoia DO from a limited portion of eastern Penedès, surrounding the Anoia River valley. Like Albet and his colleagues, part of this group’s focus is on improving rates for growers and requiring organic certification. The proposed rules for Conca Del Riu Anoia DO also include lowering yields, doubling the minimum aging period and restricting the varietal selection to indigenous grapes (so long to chardonnay and pinot noir). Which solution will be best in establishing a reputation for Catalonia’s sparkling wines? That remains to be seen. But the reality is that there are high quality wines hiding amidst the cheap and cheerful bottles of Cava, you just have to know where to look.